A victory of Nurture versus Nature. The Panama Red (named for some lady of possible legend in a story too long to go into here but which you can certainly google) is perhaps better categorized as a full proof rum, something between about 47-70%. I make the distinction in order to separate such rums from the standard strength of 38-46% and those we tend to think of as real overproofs, the 71-85% range. However, since it is termed an overproof in most reviews, I’ll just make the observation and move on. Of all the stronger variations of rum I’ve tried – Cabot Tower, the various 151s, the awesome DDL Albion 1994 60.4% and the raging monster of Longpond 9 – this one may be among the most beguiling (not necessarily the best), largely because it upended many of my expectations. It is so well made that one might, on a first try, feel he was drinking a standard strength rum and only know the difference after attempting to rise a few glasses later and toppling in an unceremonious heap (but hopefully saving the bottle). The first thing I noticed when comparing the rich red-brown Panama Red against other Panamanians on my shelf (the Rum Nation 18 and 21 year old, Cadenhead 8, Panamonte XXV and the Abuelo 12) is how almost perfumed the nose was. The others were solid rums in their way, with interesting profiles – especially the Rum Nation 21 and the Cadenhead – yet once the searing alcohol fumes blew away from this one, it evinced a remarkably different scent of jasmine, nutmeg, honey, nougat, cinnamon and nuts to go along with the slight caramel and burnt sugar under-notes. Of course, as one might expect from a more intensely proofed product, it was a bit sharp, just not unpleasantly so….another surprise. And the palate was also very different, quite strong: there was something really light and springy, almost cheerful about it. I find that many high-test rums tend to be somewhat navy in character – more taste is added at the deep end to mask the fangs of alcohol. Not here. Spicy citrus and orange marmalade, sweet honey, white chocolate, figs and sharp yellow fruit – more like almost-ripe firm yellow mangos than bananas – and a sort of candied orange chocolate mixing it up with a very slight smokiness of leather and tobacco and oak. A little ginger, cinnamon and baking spices, really nice, and unusually smooth for such a strong rum — not on the level of, oh, the Panamonte XXV – that would be lying – but smooth enough for a 54% drink….which raises the inevitable question of “dosing.” I should point out that all these varied flavours are much more pronounced if you do a comparative tasting, as I did. And the finish was lovely, long and heated: oak tannins, tobacco and a last sly hint of orange peel slinking away into your memory and taking residence there. According to what research I’ve cobbled together, the Panama Red is produced from sugar cane grown in Las Cabras de Pese in Panama (the distillery for Panamonte is also located there). The rum, made from molasses, is a blend of stocks aged in the usual ex-Bourbon casks for up to five years — oddly, the official website makes no mention of the real ageing: Jim Wasson, the CEO of Panamonte, was kind enough to provide the detail. Anyway, it’s all well and good. Yet to me – and I may be totally wrong about this, so feel free to make up your own mind or point me in the definitive direction of a refutation) – this kind of ageing does not normally impart a taste quite this rich, such a cornucopia of chirpy, limbo-dancing flavours to what is essentially a rather young rum. Now, because the interaction of oak and wood and climate, to say nothing of subsequent blending, is such a complex one, I hesitate to suggest that it’s been spiced or sugared-up and simply not mentioned…but I feel it is. Not that I mind, particularly – I’d just like to know for sure one way or the other. After all, given the wild popularity of spiced rums these days (to say nothing of the emerging backlash against undisclosed additives), there should be no issue with labelling it as such (which was the argument given by my Edmontonian rum chum, who suggested that this was why it wasn’t noted – because it isn’t). The Panama Red is made by the same crew who make the Panamonte XXV, were involved with the Ron de Jeremy (tailor made for giggles and crude mandingo jokes), and perhaps even the same original stock as the RN Panama 18 and 21 (I’m on the fence about the Abuelos). There’s something in the subtle alchemy of all these rums – many of which have had the hand of Francisco “Don Pancho” Fernandez of Zafra fame touch them at some point in their development – that suggests a common ancestor coiling lazily beneath them all. Which just goes to show how masterful blending and ageing can begin from a similar base and then make something spectacular out of it. The nurture here may really be more important than the nature. 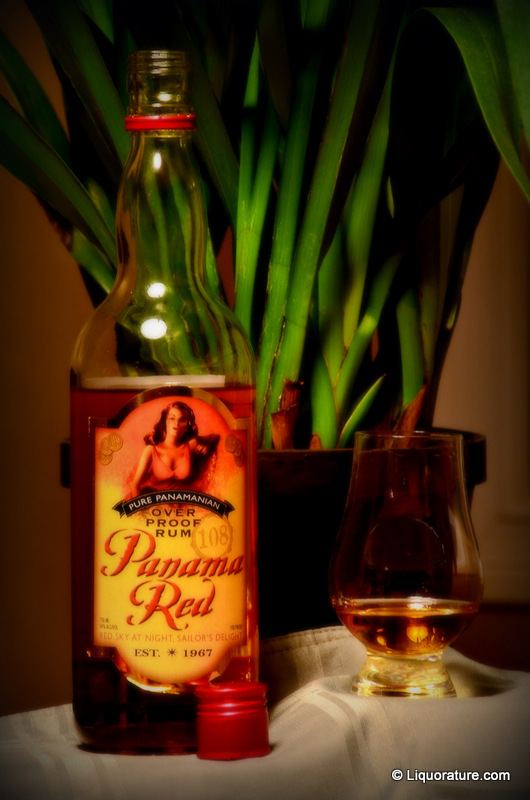 Perhaps what I really appreciate about the Panama Red is its overall smoothness, unusual in an oomphed-up rum, and its lovely palate and mouthfeel. Almost everyone I’ve met who has sampled it, expressed some level of astonishment at these characteristics, and all rated it higher than usual. And while I’m no lemming, and cast a more-than-unusually jaundiced eye on spiced and sugared rums as a whole (even assuming this is one) I must concede its quality, and give it a (qualified) recommendation myself. Whether you want to mix it with something to create a subtle, taste-drenched tropical cocktail, or simply take it by itself so you and it can tango in tandem as I did, there is no question that if you like Panamanians, want something stronger, and are on a bit of a tight budget, the Panama Red is a pretty good buy.